Hi everyone. �I am an aspiring portrait lens collector. Here I will be comparing the Helios 44m-4 58mm 2.0 portrait lens and the Meyer Primoplan 58mm 1.9 portrait lens. �My main intention was to compare the bokeh of each. �I was surprised to find how similar they really are. �This was not a well controlled test... I did not put on tripod and I manually focused (you can see in a couple pictures how the focus was slightly different. �I should mention that for the Meyer Primoplan, I brought down the exposure a bit (I would estimate 1 full stop) since even though the cameras were set exactly the same, the Meyer exposed brighter. �Other than that, each were shot on Canon 5D in RAW (converted to Jpeg in LR), minimally processed (slight increase in saturation�and thats about it... no sharpening at all). Here are the results. To view more images (will be adding more in a couple days) visit the following link. What makes you think these are portrait lenses? They are too sharp really? Great comparison shots and very interesting that they are so similar. The Biotar seems to have been the "inspiration" for the Primotar! http://forum.mflenses.com/6x-shootout-pancolar-biotar-oreston-primoplan-helios-t31237.html you might find it interesting to compare with yours. 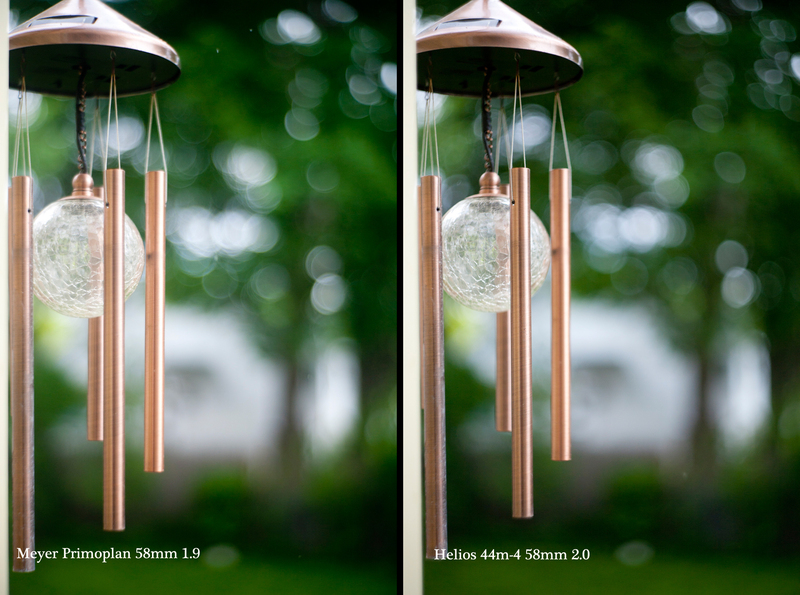 I would love to see a direct comparison of the Helios 40 85 1.5 and the Trioplan 100 2.8. Does anyone know where I can find such a comparison? If you were shooting a 7D or another crop-body camera, then I'd say the above two lenses are portrait lenses, but you have a 5D, so they're really "normal" lenses. Of course, it is often said that a portrait lens is that which whatever one is comfortable with using for portraiture, but if we more or less stick to a definition, then Moonpix's suggestion is better. That is, something in the 85mm - 100mm range. Me, I actually prefer 135mm, but see that's where the personal preference comes in again. I also agree with Pat. This is a good comparison. 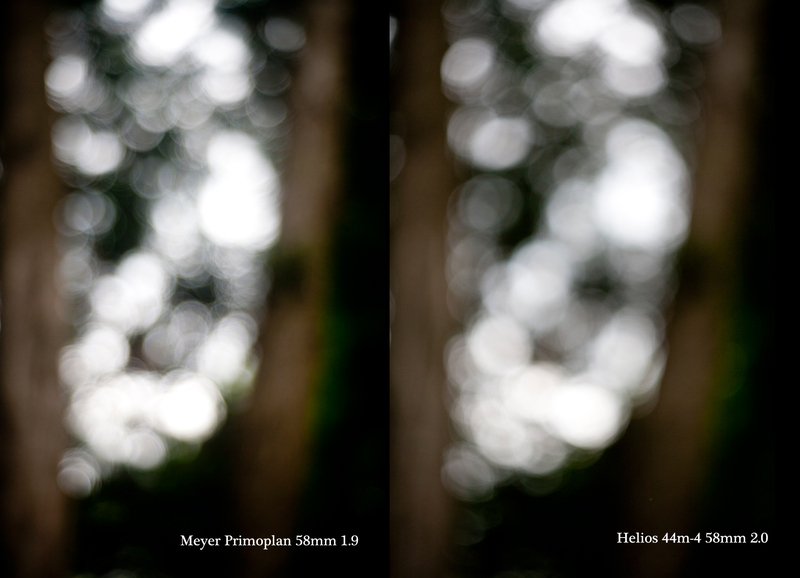 I own a Helios-44M, but I've never used or even seen a Meyer Primoplan, so this comparison has been informative for me. In fact, should I run across any Meyer for cheap, I'm now liable to pick it up just because I've got a pretty good idea that it'll be a good optic, thanks to this test. You are both correct. Technically, for me, they are on the border of actually being a portrait lens. They are and will be for me, since my main intention is to shoot portraits with these lenses. However, I do agree that longer focal lengths (70mm+) are really better for portraits due to the compression that takes place.